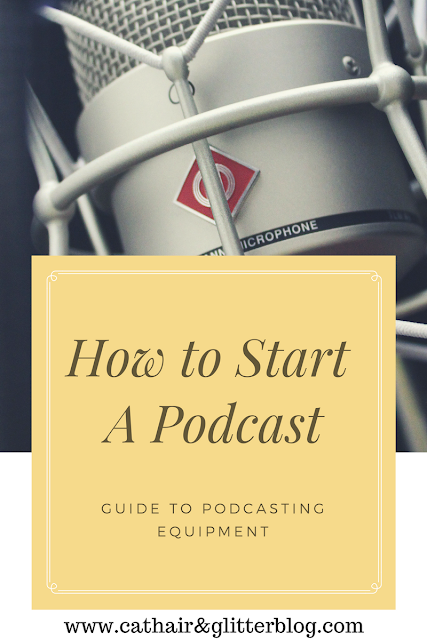 So you read the post 7 Things to consider before starting a podcast and you feel like you you are ready. The next thing I suggest is to get your gear together. This is a guide to the basic equipment you will need to get stated. We started with super basic condenser microphones. You definitely got what you paid for. The sound quality was not that great and editing was a nightmare because we could have 30 min of "can you hear me now" to edit out. I'm currently using a Blue Snowball. I love this mic. I wish it had an arm like Heather's mic because I record on my bed and sometimes I knock it over. This is a mesh like circle that attaches to your mic or its a foam like ball. The purpose is to keep your P's from popping. We didn't think his was a priority at first but it really makes a difference. I am using super cheap walmart headphones but they are getting upgraded next. I really need a pair of noise canceling headphones especially for editing. We use audacity to record and edit. Its a free program. I will do a whole post on how we edit and record. Heather and I call each other using skype and then we each hit record in audacity. We love our iphones but there are just some things you need an actual computer for. If you listened to earlier episodes you you know Heather was using a million year old laptop. Thankfully she upgraded. I record on a Dell Latitude. We tried to go free, and its possible. I actually don't remember how we did it because it was complicated. Then we switched to a hosting site that cut us off after an hour an episode (even though we were paying for extra, but oh well) Finally we switched to Podbean and have never regretted the switch. It is really easy to upload, we have all the space we want (which is great in case we do another 3 hour episode like our Kurt Cobain episode. It also allows us to have a great website, and out of this world analytics. If you sign up for a podbean account use our affiliate code hauntedfamilypb. It doesn't cost you anything extra but helps us. We use GoDaddy to set up our domain name but really you can use any domain name purchasing site. A domain name isn't necessary but it does help people find you and establishes your brand. Come back next week to continue talking about setting up your own podcast. Holly Grass. Powered by Blogger. Hi I'm Holly. Single Mom, Animal Rescuer, DIY Enthusiast and Dyselxia Advocate. © 2015 Cat Hair & Glitter. Peyton Template designed by Georgia Lou Studios All rights reserved.